ISAC fund has organized international conference/panel on December 16th 2016. titled “Chapter 30 – External Relations: Screening report and the processes of preparing the negotiation position”. 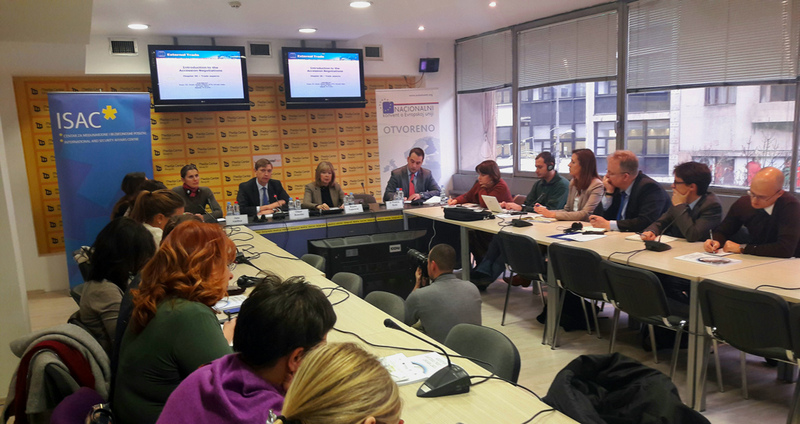 During the panel, Screening Report for this Chapter has been presented, as well as the elements of the negotiation positions of the Government of the Republic of Serbia, while special attention was devoted to Serbia’s membership in the World Trade Organisation. In addition, participants have also touched upon the main challenges that stem from this process, as well as the timetable for the implementation of reforms in order to complete the pre-accession negotiations. These and other related topics were discussed at the conference by: Oskar Benedict, Deputy Head of the EU Mission to Serbia, Jane Amilhat, Deputy Head of Unit and bilateral trade issues with Russia, CIS, Ukraine, Western Balkan, EFTA, EEA and Turkey, DG Trade of the European Commission, Bojana Todorović, Assistant Minister for Trade and Tourism, Government of Serbia and dr Predrag Bjelić, professor at the Faculty of Economics, University of Belgrade.